Here’s an attractive and fun scepter made from balloons that’s perfect for a royal princess. It’s easy to make and kids will love it. It’s also great for celebrations where you can add a royal touch by making and giving one to the birthday or other honoree to hold throughout an event. Combine this one with a balloon crown (click here to learn how to make a crown) and you’ll have a finishing touch. Before tackling the scepter, particularly if you’re a beginner, I recommend that you first learn how to make a basic balloon sword. You’ll also notice that for advanced twisters, I offer instructions on how to quickly make a scepter based on a technique to rapidly make basic balloon swords. One Heart style balloon - you can purchase these specialty balloons from a dealer. These balloons are sold in different colors. You can typically buy a single color in a bag of 100 or multiple colors in a bag of 100. 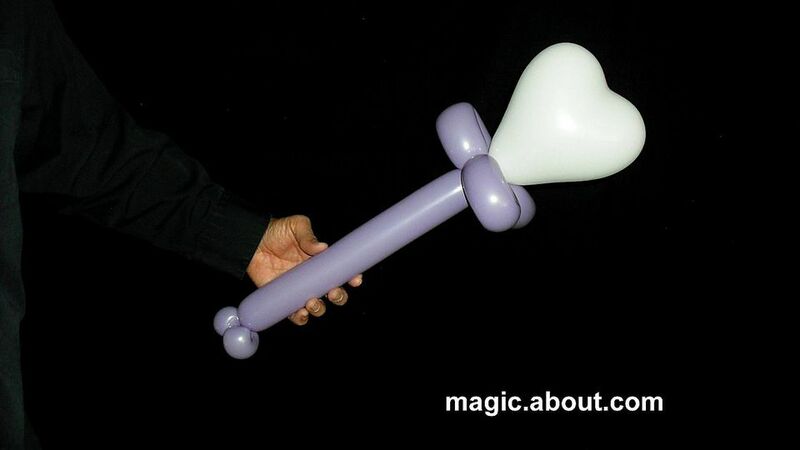 While I think that the heart balloons add a nice touch to the scepter, you can also use a round balloon. Inflate the 260 balloon - which will make up the main part of the scepter - to about three inches from the end. Make two small pinch twists to add detail at the end of the scepter. Now we’re ready to make the top of the scepter. You’ll have to do some estimating here. Look at the end of your 260 balloon and estimate three sections to make three fold twists. You’ll want these to be nearly the same in size for symmetry. As a general rule, I recommend that you start with three sections of six-inches each for a total of 18-inches from the uninflated end of the balloon to the start of the first fold twist. Estimate this from the end of the uninflated section - don’t include the uninflated section - the tip of the end of the balloon. After you’ve mapped out three equal sections from the end. Make a fold twist with the first section of the balloon, as shown the picture. It will look like you are making a fold twist in the middle of the balloon, and you are, but this will allow you make the necessary three fold twists. Just a note here. Some of you may prefer to work backwards from the uninflated end - making the first fold twist at the end of the balloon (and securing it with the uninflated portion of balloon). After this, you can follow with two more fold twists. However, the balloon tends to get "tight" when you twist the balloon in this manner. If you try to do this, be sure to keep the balloon "soft" (a reduced amount of air) as you inflate it. Make two more fold twists that are equal in size to the first one. Be sure to leave a bit of uninflated end to “tie” everything together. Twist the small bit of uninflated end of the balloon around the base of the fold twists to lock everything in. You should have something that looks like a three petaled flower that has no center. Inflate the heart balloon and then take the nozzle end and wrap it around the center of the juncture where the three fold twists come together. You now have a balloon scepter. If you know the technique to make a fast balloon sword, you can quickly crank out scepters. If you’re entertaining at a princess-themed party, this skill will be quite handy. You can learn the technique with a “z” formation twist. Briefly, you’ll twist the end of the balloon into a "Z" (zigzag) shape. And by twisting through the vertical middle of the “z” setup, you’ll make two fast fold twists. To make three, just add a fourth section to the “z” setup. Be warned, this technique takes practice but once you master it, you’ll be able to quickly make swords and scepters. It’s quite useful and helpful when you’re entertaining at an event where you have too many kids and too little time. For princess parties, make the scepters in purple (lilac) or pink. While I’ve shown a heart balloon here that’s white, you can purchase heart balloons in red, pink and other colors. Mix and match the colors as you wish. The scepters are great for parties because they’re highly visible. Make one for everyone there and they will add lots of color to the festivities. Generally, I find that boys prefer swords to scepters (even when made in more masculine colors - blues, greys and yellows). Boys seem to enjoy wearing crowns, but they see themselves as a prince or king, and, of course, armed with a sword to protect the castle, storm the castle or defend against a dragon.